Waggoner’s Gap is small gap in the Kittatinny Ridge (also called Blue and North Mountain) where PA Route 74 crosses between Cumberland and Perry Counties. It was named for a family with extensive landholdings at the base of the mountain in Cumberland County, not for its use by wagons. Hawk watching and counting have been done from two sites over the years. The first, at the concrete tower along Route 74, was used as an alternate during inclement weather. The main site sits on the spine of the mountain 75 yards east of the highway. This site is essentially a rock pile with steep descents on both sides. This enables watchers to see both sides of the ridge from one spot. This gives the advantage of being able to see off wind birds easily and increases the wind directions that are productive without requiring a physical move. The ridge runs from the ENE to WSW. The nearest major ridge to the south is South Mountain, roughly 12 miles distant. The nearest major ridge to the north is Tuscarora Mountain, roughly 14 miles away. This expanse on both sides helps limit diffusion of the flight. Trees on both sides of the ridge limit visibility of low flying birds. They also prevent detection of low flying birds coming down the ridge until they are close to the lookout. It also prevents low flying raptors from seeing the hawkwatchers until they are close. Best winds are NW and S, with higher numbers seen with NW winds, but closer views on the S winds. The official daily count at Waggoner’s Gap begins on 1 August and ends on 31 December. There is no set start or stop time each day, but in good weather, the gate is usually open from 9 to 5. This may vary especially during August and December. If the gate is locked you may park at the gate (don’t block it) and walk up the path. Fog often occurs in mornings during the fall. Since several of the counters can see the lookout from their homes, they may not unlock the gate until the fog lifts. The same applies for rain or snow. An early snowstorm can make the parking lot impassible for some time late in the season. Notes will be made on BirdHawk when this happens. 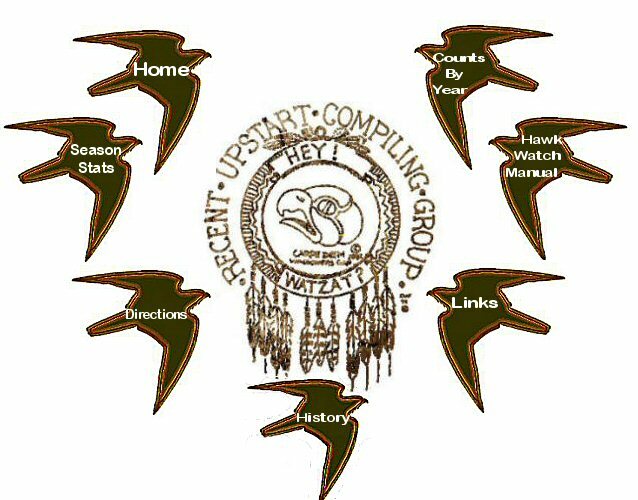 Data collected is geared toward entry in The Hawk Migration Association of North America's (HMANA) HawkCount Data System. Information should be recorded on the Hawk Migration Daily Count Sheet (appendix A) for entry into HawkCount. The official counter for an hour is responsible for the entry of data into HawkCount. Timely entry is required for generation of the daily BirdHawk report. The Daily Count Sheet should be filled out as follows: At the beginning of each hour enter the initials of the observers assisting with the flight. Enter the names of known new visitors plus the number of new visitors in the bottom margin. The hour is EST, wind speed according to the HawkCount criteria, wind direction is where the wind is coming from. Temperature is in Celsius, cloud cover is percentage of coverage, visibility is in kilometers in the direction of the best visibility, and precipitation should follow the HawkCount parameters. Flight direction and height should be recorded at the end of the hour and reflect the predominate height and direction for the hour. Flight direction is assumed to be WSW and flight height unaided eye, unless there are unusual circumstances. Counting should be done to insure that only migrants are tallied. If in doubt, don’t count. Counters should create “counting lines.” These virtual lines are the point a raptor must cross before they can be added to the count; birds circling upridge should not be counted until they pass the “counting line.” Birds that have been counted and return upridge must be subtracted. Black Vulture Do not count until 1 October. The Millwick Rd roost must have cleared before counting is begun. After then, count with caution. Do not count when vultures are recirculating. Bald Eagle Count entire season. Age as follows: Juv, White Belly, 4th yr, Adult and Unaged. Record time. Northern Harrier Count entire season. Record Male, Female, Juvenile or Unknown. Sharpshinned Hawk Count entire season. Cooper’s Hawk Count entire season. Be aware of locals early in the season. Northern Goshawk Count entire season. Record Juvenile, Adult or Unaged. Red-tailed Hawk Count entire season. Extreme care must be given to separate migrants from locals. Until Sep 15 and after Nov 20, only count horizon to horizon fliers. Rough-legged Hawk Count entire season. Note color morph. Golden Eagle Count entire season. Record Juvenile, Subadult, Adult and Unaged. Record time. American Kestrel Count entire season. Use caution in August to separate migrants from locals feeding on insects. Peregrine Falcon Count entire season. Record Juvenile, Adult, and Unaged. Record time. UA,UB,UF,UE and UR - use these when in doubt. Others - record time of day, detailed description and names of those who saw the raptor. Annual report - The compiler is responsible to produce a written summary report and distribute it to the regulars.